Today’s been quite a day. I have done positively… nothing. Terrell was a stage, a time, in which I ran free across the prairies. I made childhood memories and experiences. I learnt that electric fences really do shock you. (Don’t even ask), that hard work is important, and should be a part of life, that families should be close, and friends are important. The people I associated with were simple people, mostly neighbors that lived in a small town, church friends (mostly friendly Hispanics, Americans, and Brazilians), and all our social groups were small and closely knit. I spent a lot of times outdoors. I loved the moaning of the wind; he enjoyed making the grass seeds dance and sigh in awe of his power. He played with them for while, then moved on to tease the horses’ manes and make them all giddy with his attention. The wind ruled the prairies, that was certain. The sun is hot in Texas. (Well there goes the understatement of the year! Right on time too, I was afraid this year wouldn’t have an understatement!) The Texan sun is a little tiny foretaste of hell. It dries up the already dehydrated ground until it cracks into large open wounds. The grass is long, tall, and as dry as dust, and the whole state seems to want to pause and be scorched in peace. Everything is hazy, and the sun just makes you want to be lazy, and die in peace. But when you live on ten acres of land, you’ve got lots to do! My chore was to clean the chicken coop, and under the Texas sun, chicken poop wasn’t quite appealing. (Is it ever?) But it had to be done, and I did my chores as well as my schoolwork. Father had the maintenance around the house including watering the fruit trees, tend the garden and keep up with his mission work. Mother had a toddler on her hand, a garden to tend, a house to keep running, and my schoolwork to give out. We were busy, and we were happy. One of my other chores, was to keep the grass on the first five acres in front of our house, at a decent height. Which means the small lawn tractor and I became best buddies. (I crashed him. Once. Only once, into the back porch column. Luckily the porch wood was stronger than my impact, and only the tractor was hurt, not me, nor the did the porch come crashing down.) 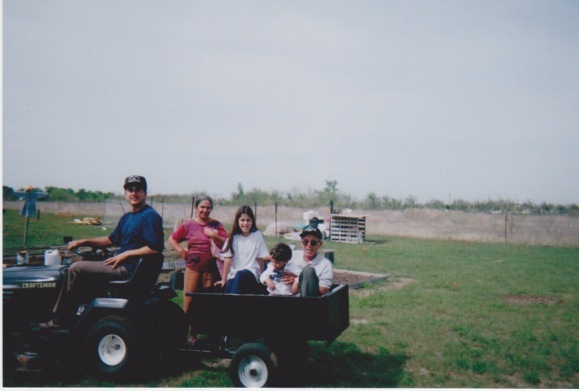 I drove that tractor up and down our yard mowing, or taking buckets of water, loaded onto the small little trailer it pulled, to our precious fruit trees in the back portion. Keeping fruit trees in Texas soil, takes work. And my parents? My parents planted a grand total of thirty-four trees! counting with the four pine trees in the front yard, a few shade trees around the front porch, a few berry trees around the house in order to block some of the sun’s piercing rays, fruit trees and all. Daddy had to carve (one doesn’t dig Texas soil, one carves the earth instead) out a place for each tree, then he added compost, planted the tree, and then every few weeks he’d stir the soil around the tree, add mulch, and water it. And boy did we water them! Every blessed evening, every blessed summer. It was hard work, and I don’t remember ever arguing against bedtime. I was happy. I had three best friends, (Ilea, Alina, and Crystal, all girls from church who like me, were also home schooled) two dogs that belonged to the neighbors, but were always on our property, which meant I had the benefit of dog company, without the feeding, and upkeep. When I had finished my schoolwork, as well as my chores, I was allowed to go take on the land and do with it what ever came to mind. Crystal and I played in the rare lush green grass of spring, sneaked under barbwire to get to the neighbor’s pond just for the fun of trespassing (it was not my idea, but I didn’t try to dissuade her either because 1. it’s impossible to change Crystal’s mind, and 2. I didn’t want to be a sissy). Time with friends was special, sleepovers prevalent, planned outings such as camping trips, and zoo outings also occurred and we bonded over the “Practical Lessons Series” planned by the church ladies. Every week an adult would teach our little children’s group, something practical. Women taught us to bake bread, arts and crafts, and the men taught us how to, um, change car tires, and plant fruit trees. One summer I worked for our Bible Worker’s wife, filling up cloth trivets with sand, because I ‘needed’ money to by a purse (of all things) from Claire’s. I almost changed my mind, spending my hard earned money all at once. But I spent it anyways, and I still have that purse. I don’t use it, it’s much too small, but I keep it as a reminder of the first time I learned the value of earned money. Texan weather is a crazy thing. Weather is crazy everywhere, but in Texas, things can get even weirder. One time, I awoke to the deafening split of lightening nearby. When I sat up in bed, I noticed the light in the living room was on. My parents were at the window looking up at the sky outside. The heavens were being lighted up, reminding me of something you’d see in a mad scientist’s lab in the movies. The lightenings crashed nonstop. It wasn’t raining, there were no clouds in the sky it was a clear black background for the lightening that kept coming and coming one after the other, and eventually we couldn’t stand the brightness any longer. Daddy closed the blinds, turned off the light, and we sat on the couch. The couch was facing a window, and we sat there, for a long time, just staring at the closed blind that wouldn’t stop lighting up as if someone were turning a light on and off and the light just wouldn’t burn out. Where we lived, happened to be the tornado valley. Thankfully, we never had a tornado in our area. Except for a mini one. Once. We had just come home from a shopping trip in Dallas, and I was happy because I had gotten Polly Pockets. Father was on the phone, and Victor was taking a nap. Mother was the only one paying any attention to the skies. They were dark. They were mean looking, and the clouds kept coming closer and closer. Eventually I stood beside my mother and held her hand as we looked outside our kitchen door. My swing set crashed over, the small plastic pool flew two lots over, and everything kept flying around- leaves, trash, wood pieces, branches, anything the wind picked up. But after it was all over, the sky became so so clear, and I witnessed one of the most gorgeous sunsets I have ever seen. Which sort of makes me wonder, if perhaps, the uglier the storm, the brighter and prettier the sunset. My buddy, the Craftsman tractor with the trailer he pulled. Daddy’s driving, Grandma and Grandpa were visiting us for the second time. Victor and I were loving it. Previous Article From: Him. To: You. Wow that's a lot of moving! Would you have had it any other way if you could change the past? Would you have rathered staying put in one place? cdnkaro – Haha, I didn't even know that was possible! I'm glad your liking it (: Thanks. Oh, yes ma'am, it sure is. I love this story, Larissa!